Learn the basics to be able to understand and communicate in Yucatecan Spanish, including the most commonly used phrases like “¡vaya biem!” (have a nice day). It is said, with good reason, that in Yucatán the people speak differently; you only need to meet a Yucatecan or hear people talking in the street, the mercado, or the shopping malls to catch the peculiar and characteristic accent that usually emphasizes the last syllable of each word, that pronounces as “m” the final “n” (changing words such as “pan” (bread) to “pam”), or pronouncing the “h” as “j,” the “x” as “sh,” and more. These pronunciation and lexicon characteristics, and even different word meanings in Spanish, make the Yucatecan Spanish unique in all of México. 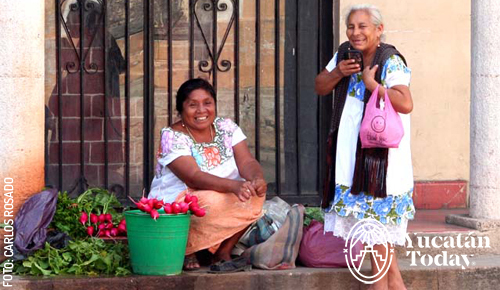 Regardless of the social environment, in day-to-day speaking by Yucatecans, many words with Maya origins have remained that can be strange and unfamiliar for visitors, but once you are familiar with them everything will be easier. You will hear, for example, “tuch” (navel), “loch” (hug), “xix” (remainder), and “xux” (be alert), in normal conversations. As part of the pride about this peculiar way of speaking, many products (t-shirts, souvenirs) have been created with phrases in Maya and in Yucatecan Spanish; you can even find a Yucatecan passport, Maya – English dictionaries, and websites to find the most common expressions used in Yucatán. But, which is the reason for this unique way of speaking? One of the answers, undoubtedly, is the influence from the Maya language that is still spoken today by a large percentage of people in the Yucatán Peninsula, mainly in towns near Mérida and in rural areas. Another explanation about the different the way of speaking is the geographic and cultural isolation of the Peninsula from the center and north of México. Because of communication access with the Caribbean and even with areas in the US, peninsular Spanish has become enriched with idioms and Caribbean meanings. That’s why Yucatecan Spanish has such a soft cadence, with marked pronunciation and a mixture of some words with Maya idioms and others that are more Castilian. Here are a few recommendations to help you understand Yucatecan Spanish: if somebody tells you “a te lo devuelve,” it means that it will be later. The phrase “lo busco, lo busco” means both to search and to find. It’s perfectly acceptable to mix words in Maya and Spanish, so we suggest you learn a few basic words: “peek’ ” means dog, “xnipec” is a kind of hot sauce with tomato, onion and cilantro, “boxito” is boy, “chichí” is grandparents, and “mare” and “uay” are expressions of amazement. “Pásame el negociante” can be used to ask for any kind of object; if you are asked “¿de qué te toca?” they are asking you for your relationship, and “majado” is something smashed. We hope that everything “te vaya biem” (goes well) during your time in Yucatán, and that you soon will be speaking Yucatecan Spanish!